Born Elizabeth Ann Bayley, on August 28, 1774, she was the second child of a socially prominent couple. Her father was a Doctor in New York City. Her parents were among the earliest colonial settlers in the New York City area. Her mother died when Elizabeth was three, and her father remarried Charlotte Amelia Barclay, a member of the Roosevelt family. His new wife became very active in the Church, and would visit the poor in the homes to distribute food and needed items. She often took the young Elizabeth with her on these rounds of charity. The couple had 5 children, but the marriage did end in separation. Their stepmother in this breakup rejected Elizabeth and her older sister Mary Magdalene. Their father had to travel back to London to further his medical studies, leaving the two girls with their aunt and uncle, to be raised. Losing a mother for the second time, Elizabeth experienced a period of darkness, which she wrote about in her journals. But as a young lady, she married William Seton at the age of 19, in the Episcopalian Church. He was a wealthy businessman in the import-export trade. Elizabeth had five children in this marriage. Although she was busy raising her family and taking care of their home, she continued to show concern for the poor of the city. She helped organize a group of prominent ladies who would visit the sick and poor in their homes to provide whatever aid they could. Informally, this group was called the “Ladies of Charity”. By 1802, with the blockades in the United Kingdom, and with several losses’ of her husband’s ships with imports and export goods, her husband had lost his business and went bankrupt. This caused him to fall ill, and he was ordered by his doctor to move to Italy for he warmer climate. Elizabeth and her eldest daughter went with him, but upon arrival were held in quarantine at which time her husband died. Her late husband’s Italian business partners took them in. It is here, that she was introduced to the actual practice of Roman Catholicism. Soon after, she returned to the United States, and converted to the Catholic faith. She was received in March 1805 at St. Peter’s Roman Catholic Church in NYC, the only Catholic Church in the city. In order to support herself and her children, she started an academy for young ladies, as was common for widows of social standing in that period. Due to her conversion to Catholicism, most of the parents pulled their children, due to anti-Catholic sentiment of their day. By Chance, she met a visiting Priest who was a member of the French community of Sulpician Fathers. He had fled the religious persecution in France, and was in the process of establishing the first Catholic seminary in the United States. He had always envisioned a school to meet the educational needs of young Catholics. Elizabeth moved to Emmitsburg, Maryland, to support this community. It was there that she established the St. Joseph’s Academy and Free School, a school dedicated to the education of Catholic girls. This was possible, due to the financial support of Samuel Sutherland Cooper, a wealthy convert and seminarian at the newly established Mount St. Mary’s University, begun by John Dubois, S.S, and the Suplicians. Elizabeth went on to establish a religious community in Emmitsburg, dedicated to the care of the children of the poor. It was the first Congregation of religious sisters to be founded in the United States, and its school was the first free Catholic school in America. They were initially called the Sisters of Charity of St. Joseph. From that point on, they simply became known as “Mother Seton”. The remainder of her life was spent in leading and developing the new congregation. Mother Seton was described as a charming, spiritual, charitable and cultured lady. Her connections to the New York high society did not deter her from embracing the religious vocation and charitable mission she was on. She lost two of her daughters to illness, and several of her young Sisters. Finally, she died on January 4, 1821, at the young age of 46. She is entombed in the National Shrine of St. Elizabeth Ann Seton, in Emmitsburg, Maryland. Today, six separate Religious Congregations trace their roots to the beginnings of the Sisters of Charity in Emmitsburg. They are based in New York City; Cincinnati, Ohio; Halifax Regional Municipality; Convent Station, New Jersey; and Greensburg, Pennsylvania. 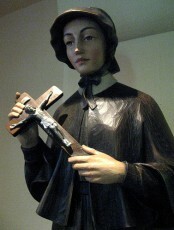 In December 1595, Elizabeth Ann Seton was declared “Venerable”. She was beatified by Pope John XXIII in March 1963, and canonized by Pope Paul VI in September 1975. She is the first native-born United States citizen to be canonized. Elizabeth Ann Seton was born in New York City – and lost her mother at the age of three. Her father remarried, and had 5 more children with her step-mom. She eventually lost her new stepmother, and grew up quickly. She married at the age of 19, and had five children. Early into that marriage, she lost her husband to illness. She eventually supported a religious community, and moved to Emmitsburg, Maryland. It was here that she founded a Free Catholic school and academy. She also became a Nun, and founded the Sisters of Charity of St. Joseph. She was the First native-born American to be declared a Saint, and many miracles are attributed to her. Many visit her tomb at the National Shrine of Elizabeth Ann Seton, in Emmitsburg, Maryland. To this day, many report miracles from visiting her tomb.